Discussion in 'Software' started by oidua, May 17, 2014. For various reasons there seem to be some problems installing Toontrack EZdrummer v2 including libraries and thought it'd be useful to have a thread for discussion. So please post your problems & solutions here. Also "Your library seems damaged. You will need to reinstall the full product before applying this update." deleted all before dot so the file name was .ttauth and it worked for me. Hope it helps you. Guys there is a support thread on the release itself, please don't start opening topics on this and use that one instead. If it fails to resolve your problem then wait a little and open a thread here. Yes , but at the release thread the posts are all over the place in-between "Ahhhh great release" and "links please" and so forth. I was ready to comment the same than you but finally I could run it using the jeremingway steps . I used wine/winebottler on OSX Mavericks for the keygen,had a bit of problems with this myself.You generate the.ttauth file pretty much as I've seen. Or are you just trying to reg the standalone? It most definitely works on Mac at least Mavericks for sure that I know.I got all the expansions working,all the midis loaded,etc. Yeah i'm having trouble registering ("authorization failed"). Also using winebottler. Installed EZ 2 + update (v.2.0.1) in sequence, and using key gen from the update. I followed all those steps but still isn`t working. I removed AAX file, but probably isn't that because i`m using Logic Pro X.
I had same issue when installing on Mac,I can't exactly remember what I did,I may have saved the ttauth in a different location. I have a Mac Mini here I'm working on. As soon as I get time I'll install on there and see if I can help any better. Gonna be a lil while longer till I can try. Need an hdmi cable for this mac mini,before I can hook it up.He didn't bring one or the lil adapter that turns a mac display out to a vga. @Ken I had a similar issue when I installed,I think I made 4 or 5 until it worked,no harm some just didn't work.Deleted those ones if they didn't authorize. Or I may have misunderstood you.You can't create a .ttauth? U remove the asterisk? Name it whateveryouwant.ttauth? I can't remember if it mattered what location I put it in either. Winebottler makes a few different folders and by default I think it's the wine folder when you try to save the .ttauth.Or theres another documents folder or something. I know now the aax thing was a problem until I deleted it,reading other comments. I know I got it working though,and I know it took me like 10 times until I got it finally. I was losing my mind over it,uninstalling reinstalling,double checking with batchmod,etc,lol. And it was something simple too. Think I may have tried a couple different versions of keygens too.I think the order was install,patch,delete aax,then authorize. I'll give an update soon. I mean no disrespect,I just read all of that thinking it may be relative to what I,nano squeff,& Ken were talking about. I got all the way through it and read the Win 7 thing at the end.Was just joking around with the facepalm.Mean no harm. i will try again tomorrow - saving the .ttaugh file on a different location, maybe on a different folder (outside wine bottler) and.. let`s see! hello everyone, i'm new in this site and I have the same problem. 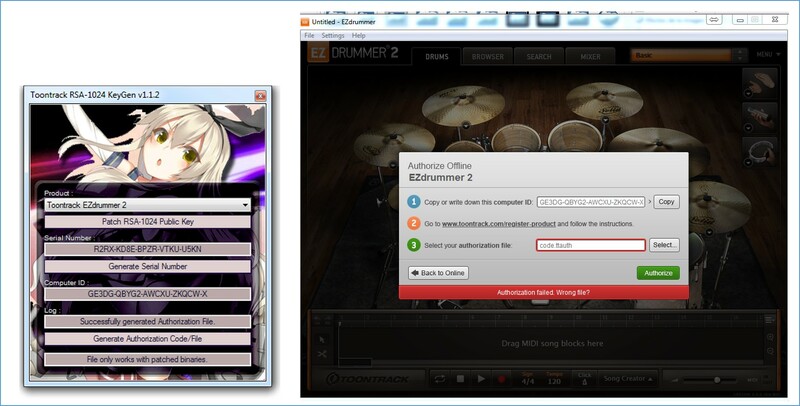 Ezdrummer2 works fine as standalone but when I open Logic Pro X the software keeps asking for the authorization file. I know the reason for that is probably the aax but I have no idea how to delete that thing, can you help me? Guys, I just can't make the keygen run proper in crossover/wine (i'm running osx mavericks) and when i create a key/authorization file in windows it says it`s a wrong file. Also, the second step intrigues me. 4.Run the software and start activation. 6.Copy ComputerID to the keygen. 7.Generate a Serial Number and an Authorization File.